Has your pup's tail ever been closed in a door, or have you discovered ticks on your gorgeous long-haired pooch? What would you do if you found a dog in a parked car on a warm day (anything above 70°F is considered too warm)? How about if your terrier looks more like a bulldog from swelling caused by a bee sting or snake bite? Bandaging, removing parasites, treating heat stroke and upset tummies are basic Pet First-Aid skills every pet parent should possess. April is National Pet First-Aid Awareness Month, and although it is a topic pet parents should have on their minds year-round, this is a great time to make sure you are PAWpared with both great skills and an up-to-date kit. Although veterinarians are the experts, most of us are not lucky enough to have a vet velcroed to our hip 24/7. Even if you live with 5 people in your home, odds are that when the dog stops breathing or cuts his paw…you will be home alone and it will be after veterinary hours. To be a pro-active pet parent, you MUST know how to rescue Rover or help Fluffy feel better BEFORE professional medical care is available. What happens in those first few moments after the onset of injury or illness can truly make a difference in your best friend’s recovery. Preventable accidents are the leading cause of death among pets and according to the American Veterinary Association (AVMA), 9 out of 10 pets can expect to have an emergency during their lifetime. Do you know how to stay calm and rise to the task? Lower your pet’s body temperature to prevent brain damage or death. Minimize blood loss and prevent infection by properly bandaging a wound. Knowing where the critical arterial pressure points are on your pooch can be a life-saver! 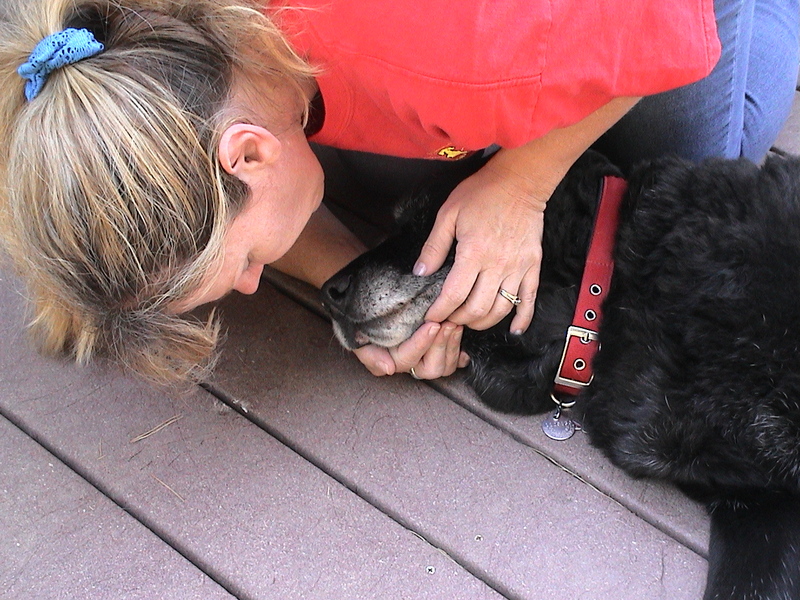 Alleviate choking with the doggie Heimlich-like maneuver. Expel poison from your pet’s system by properly inducing vomiting. Be the pump your pet's heart can't be, moving life-giving blood and oxygen throughout his body, until you can get him to professional medical help. Pet First-Aid is by no means a replacement for veterinary care and CPR (now Cardio Pulmonary Cerebral Resuscitation) is not a cure, but both can make a difference in the life of your pet. Knowing these skills helps you work as a team with your veterinarian to help your best friend live a longer, happier, healthier life by your side. Look at life from your dog’s perspective. What appears as a neatly kept room from a 5 to 6 foot viewpoint is a completely different scenario to a 7 inch (Chihuahua) to 14 inch (Old English Bulldog) off the floor. If it’s in paws reach, it’s fair game for even the most obedient canine. Add to that their incredible sniffers! As humans we rarely notice the sweet aroma coming from our morning coffee, yet dogs can detect a spoonful of sugar in an Olympic-sized pool of water! If it smells good, they might investigate more closely and that includes shelves, behind doors and countertops. Cleaners and fertilizers not absorbed through paw pads will be ingested when your dog grooms himself, so take note of what you put on floors and the yard, choosing only pet friendly chemicals. Look your dog over from head-to-tail every week feeling for lumps and bumps. Notice if his skin his dry, his coat dull or shiny, if there is evidence of parasites (flea dirt or the actual critters), burrs or foxtails. Anything you find early (especially a lump) may prevent a nightmare from occurring, so bring it to your veterinarian’s attention at onset. Know your pet’s baseline vitals and pay attention to what he looks like when he stands/sits and how often he asks to go out. The more quickly you spot something ‘not quite right,’ the better chance of fixing it. Never miss annual vet exams as each calendar year is equal to almost 7 years in the life of your dog, meaning a lot can change. Drive there before you need to, so that you know where to enter, what services are offered and how they accept payment. Don’t just program the number into your cell. When you have an ill or injured pet, you want to know which side of the street it is on and where the closest entrance is. Pets are part of the family! That’s why we bring them into our hearts and homes, so unplug from electronics when you take Rover on a walk, don’t mindlessly pet Fluffy while you’re reading a book. Animals are in the moment with us. Give your best friend the same courtesy. He’ll love you even more for it! Here are a few resources to find a pet first aid class or instructor near you! About the Contributor: Denise Fleck is an award-winning author, animal care instructor and radio show host who developed the curriculum for her Pet First-Aid & CPCR Classes after training with dozens of schools and organizations, practicing, attending seminars and practicing some more. She has taught more than 10,000 animal lovers life-saving skills and has appeared on Animal Planet’s Groomer Has It and Pit Boss, A&E’s Kirstie Alley’s Big Life, CBS-TV’s The Doctors, CNN Headline News, PBS-TV’s Lassie’s Pet Vet and KTLA Los Angeles as well as on radio and in magazines. Learn more at sunnydogink.com.